A blog by Theresa W. Devasahayam, SI UN Representative for Bangkok. 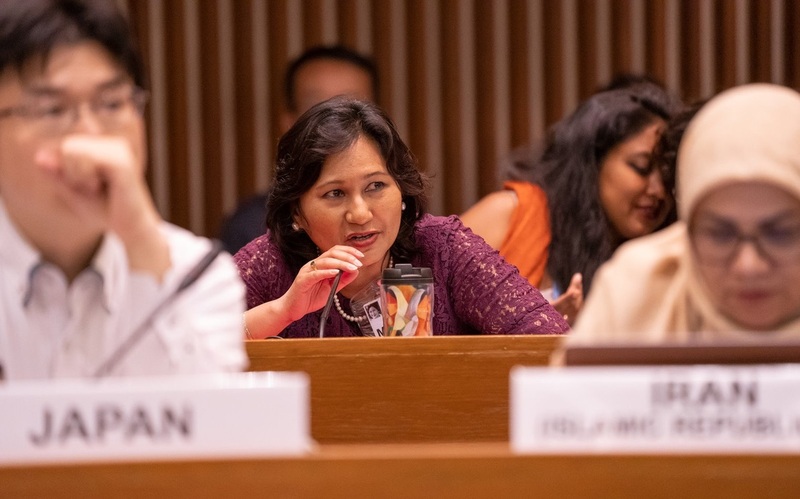 “The theme of the sixty-third session of the Commission on the Status of Women (CSW63) focuses on social protection systems, access to public services, and sustainable infrastructure for gender equality, and the empowerment of women and girls. Women’s right to social protection systems and access to public services are embedded in the Universal Declaration of Human Rights, the International Covenant on Economic, Social and Cultural Rights, the Convention on the Elimination of All Forms of Discrimination against Women, and other related international agreements. In recent decades, social protection refers to a policy framework to address poverty and vulnerability*. Social protection includes public and private initiatives which provide cash or consumption transfers to the poor and marginalised groups, such as women, with the intent of reducing economic and social vulnerability. Among women, social protection should include comprehensive protection across the life course. For women, social protection can cover something as basic as maternity leave. In many instances, cash income has also been used to enhance access to public services. Social protection initiatives for women are meant to mitigate risks and create resilience in the face of economic, social, environmental, and demographic changes. Globally, on average countries spend 11.2 percent of their budget on social protection. In Asia, the average is much lower at 6.6 percent. In other words, in the region, there is a need to spend much more on social protection measures accompanied by the need to make spending more equitable. Women in Asia and the Pacific still face many more barriers than men in accessing social protection. For example in Asia, only one-third of women workers benefit from maternity leave. Informal workers and migrant workers are also left behind when it comes to maternity benefits and other health insurance schemes. Social protection initiatives are often associated with formal employment, this acts as a barrier in how women access social protection, especially since they more than men would leave the workforce to provide care for children. Thus, it is important that governments should look into non-contributory pensions especially for groups unable to engage in the labour force, such as women. In fact in nearly all countries, women’s pensions are 36 percent less than men’s for the obvious reason that the former are more likely not to engage in uninterrupted formal work as long as men. In many countries in Asia and the Pacific, many people continue to make a living through self-employment. In India, for example, around 81 percent of all workers are found in the informal sector. That most informal sector workers lack social protection indicates the urgency to ensure that this group is covered. Moreover, in countries like Indonesia and Thailand the majority of informal sector workers continue to be women, as women more than men tend to lack the skills to enter formal employment. This demonstrates that women are more vulnerable and are in dire need of social protection. In Asia, vulnerable groups such as women have seen some progress in terms of access to social protection, public services, and sustainable infrastructure. In some countries, gaps in retirement age have been closed lending to a reduction in gender bias and, in turn, a reconfiguration of social protection. Parental leave provisions have also been redesigned to incentivise men to take on more childcare. Yet significant gender gaps continue to persist. There has also been evidence that in some contexts, efforts to emplace social protection have been threatened by budget cuts and austerity measures. Moreover, in some countries, women and girls continue to be disadvantaged in their access to quality public services because of gender stereotypes. There is a common assumption that social protection consists of costly targeted transfers to economically inactive groups such as older persons, persons with disabilities as well as women. Conversely as argued elsewhere, social protection can be affordable and should be extended to the entire population since it has the effect of empowering marginalised groups and transforming structures of inequality. To this end, social protections have the potential of achieving the Sustainable Development Goals. That public services and sustainable infrastructure are integral to achieving the Sustainable Development Goals and, in turn, the 2030 Agenda for women and girls suggests that there has to be a transformation of structures of inequality in order for women to access relevant and needed services. Social protection also requires the injection of resources and better targeting of public services to benefit women and girls. While cash transfers have a positive synergistic impact on women, this can only be achieved as long as fiscal infrastructures are in place to achieve this goal. Moreover, the design and delivery of public services must be transformed to prevent discrimination and to support the empowerment of women and girls while simultaneously there has to be policies to ensure safeguarding women’s and girls’ access to social protection, public services, and sustainable infrastructure. *Barrientos, Armando (2010) “Social Protection and Poverty.” Social Policy and Development Programme Paper Number 42, United Nations Research Institute for Social Development. **Devereux, Stephen and Rachel Sabates-Wheeler (2004)”Transformative Social Protection.” IDS Working Paper 232, Institute of Developmental Studies, University of Sussex.